Xeric, Water-wise, Drought-tolerant—What Does it All Mean? We throw around a lot of terms about plants that use less water. With a crippling drought on our hands, let’s break the terms and what they actually mean. Xeric was a term coined in the early 80s by the Denver Water Board to classify a type of plants that actually evolved with drought. These plants function completely normally in dry conditions. They continue to flower, set seed, and generally thrive in dry conditions. Xeric plants include all sorts of varied trees, shrubs, perennials, and even many bulbs (which need a dormant, dry season each summer to recharge). 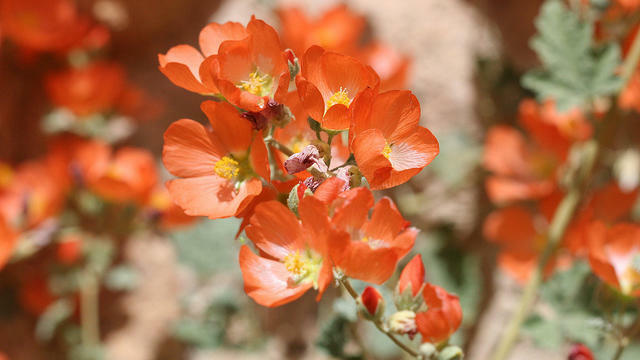 Think: globemallow, oak, penstemon, yucca, or any Mediterranean plant which, by definition, needs a dry summer. The problem? The clinical-sounding word evokes sparse imagery of a couple of cactus and course, rocky mulch. “Xeric is a terrible word,” says David Salman, founder of High Country Gardens. Here at Sunset, we steer clear of it for the same reasons. “It sounds like the word ‘zero.’ That, or people just don’t know how to pronounce it,” Kathy Brenzel, head of our garden department, told me. With the term never catching hold, drought-tolerant and drought-resistant have taken its place as industry standard. The trouble is, a drought-tolerant plant is quite different form a truly xeric one. A drought-tolerant/resistant plant uses a survival mechanism, such as defoliating or going dormant, to survive abnormally dry conditions, but it needs moisture to resume its normal lifestyle (flowering, setting seed, looking great). Salman offers the lilacs of Santa Fe, brought in the 1800’s on wagon trails, as the perfect example of drought-tolerant plants. Lilacs will survive drought by losing all of their leaves. But five years into Santa Fe’s historic drought, they’re dying—they cannot thrive unless they return to normal moisture conditions. After 20+ years of everyone else using the terms xeric and drought-tolerant interchangeably, Salman acquiesced—he lists truly xeric plants as drought-tolerant in the High Country Gardens catalogue because he thinks more people understand that it means low-water use. Native plants also get tossed into the mix when talking about water-saving options. This, too, is rife with problems. The definition of a native is up for some debate. Most experts consider a native to be any plant that grew in America before mass European expansion, and they say that choosing a plant based on the type of region it evolved in (coastal bluffs, alpine ranges) is more important than state boundaries. By no means are all natives xeric. Pt. Reyes, checkerbloom, for example, is endemic to the marshes of Northern California and needs to be kept moist at all times. Yarrow, on the other hand, needs no summer water. Other terms floating around include water-wise, low-water, and unthirsty. Salman and fellow nursery founder David Fross of Native Sons Nursery sing the same tune on all of these: They sound good, but botanically? They’re vague. Additionally, there’s the oft-forgotten point that any plant, be it xeric, drought-tolerant, California native, etc. needs water to get established—usually meaning regular supplemental irrigation the first 2 to 3 years (even globemallow, penstemon, and yarrow). As someone who is constantly writing these plants, I struggle with what term to reach for. I’ll admit that the alliteration of water-wise is pretty appealing. We’re also embracing more accurate (but less clinical) terms like dry-adapted, or Mediterranean (which is fitting for the West Coast). Do you have thoughts on the water-wise lingo? Let us know below.